Blog Hoppin': Back to School Gifts! Hey y'all! I'm Michelle Hudgeons from Smitten With First. This will be my 7th year of teaching. I have taught Pre-K, Third, and First. Out of all of those, first grade is my absolute favorite. When I am not in the classroom, I am spending every moment I can with those two cuties you see below. They make my heart all kinds of big! 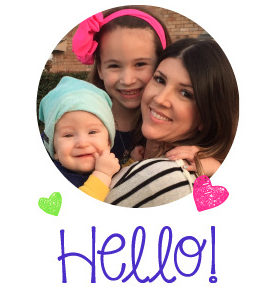 When the girls at Blog Hoppin' asked me to join them I just about did 5,000ish flips down my driveway! Thank goodness we live out in the country where not that many people had to witness that! Whew. Ok, let's get to it shall we?! I have a few back to school freebies for you all. I am always trying to change up my back to school gifts that I give my team each year. I try to keep it very simple and cheap because we all know how much money we spend during those summer months. Lots! Can I get an amen?!? This year, I went with gum. Our grade level work room has a "choose joy" theme, so I made these tags that say "CHEWS Joy". I also made a few that say "Here's to a POPPING good year". You can download both tags here. 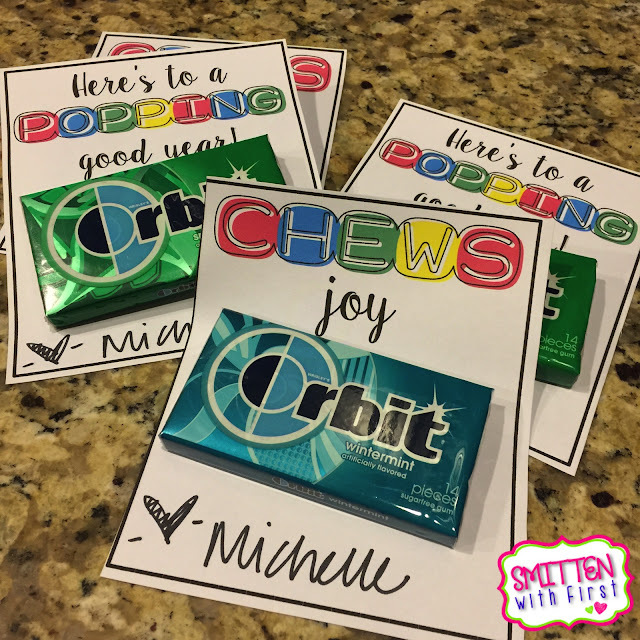 These tags by Sweet Metel Moments are perfect if you are looking for gum tags that your child can give to their teacher. 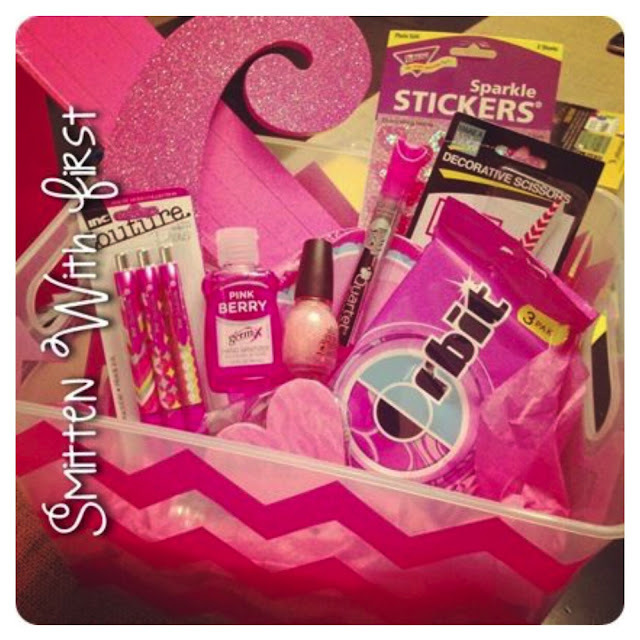 When my daughter was in Kindergarten two years ago we made this pink basket for her teacher. She wanted to do the same thing for her teacher this year, so we grabbed a few pink items at Target and put them in a basket to let her teacher know that she is "tickled pink". This year our school is doing "Fired Up for Learning" with dragons and a medieval times theme. 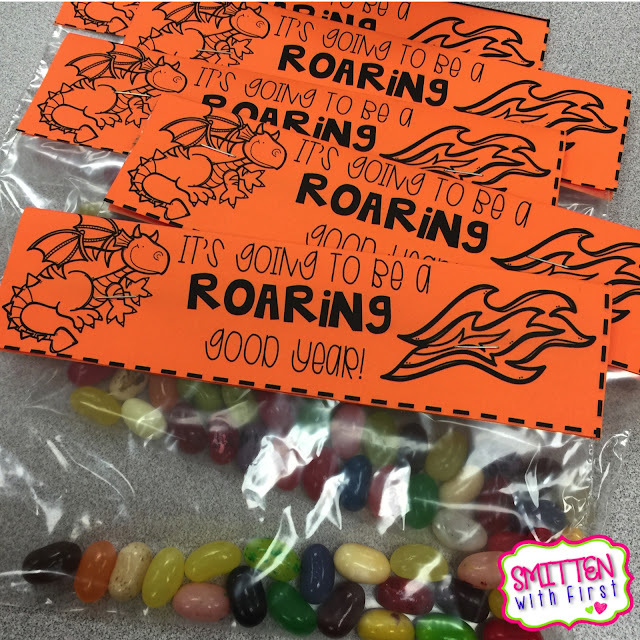 I like to have some type of a treat for my kiddos to take back home with them from Meet the Teacher, so after finding this idea of using jelly beans for dragon eggs, I made these tags to staple to Ziplock bags. I also found this idea of using Doritos for dragon scales on Life is a Party. 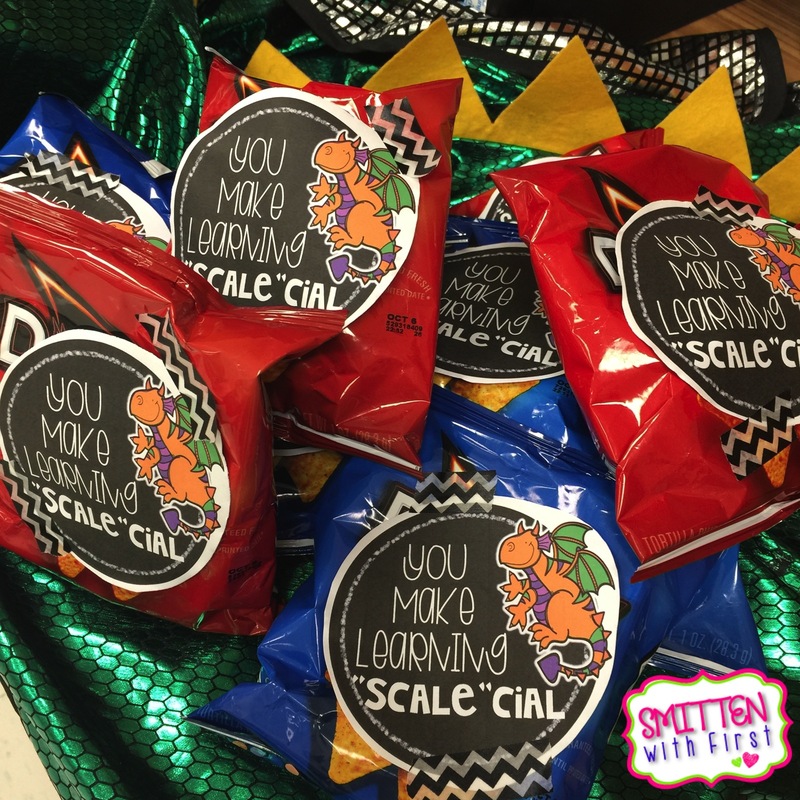 I will probably put these in our main workroom for all the teachers to have as a treat on the night of Meet the Teacher. These could also be a fun parent gift. Who doesn't love to eat chips?! You can download these tags here. Today is the first day back for teachers. I'm excited to get back to it, but I sure will miss wearing pajamas and no make up all day. Our students start back next Monday. How about you? When do your students start back?